Let’s take inspiration from this year’s Tour de France and the Rio Olympics and get kids moving this Summer. We explain why eating the right foods are important to maximise performance and give you 5 tips to best fuel kids’ exercise. When it comes to performance carbohydrate is the body’s preferred fuel. When we eat carbohydrate rich foods we store this as glycogen in both our liver and muscles. Carbohydrates digest and absorb into the bloodstream quicker than fats and proteins. When we exercise, the glycogen acts as our carbohydrate fuel to power our muscles efficiently. Tip 1 – Before the kids do a full day of exercise, a dinner which includes complex carbohydrates such as wholegrain pasta, rice and bread is important. For kids, a simple meal of wholegrain pasta, chicken breast pieces, tomato sauce and peas sprinkled with a little cheese is ideal. Tip 2 – After a day of exercise, it’s important to get a quick source of protein, a fun way of doing this is to make up a protein smoothie for the kids (but no protein powder please) which makes them feel full, and is tasty too. We like this banana, peanut butter and cocoa recipe from the Taylor House. The right type of fat is good for you, especially growing kids. It plays a number of key roles in relation to exercise, such as acting as an energy source and helping with the absorption of vitamins and minerals. From a recovery perspective, healthy fat sources such as omega-3 have shown to reduce inflammation and could potentially aid in the recovery process from exercise. Tip 3 – After exercise: oily fish, avocados, nuts and seeds are great sources of omega-3. For fussy eaters, and children that are allergic to peanuts, we really like the Nakd Nibbles, which are great for kids to munch in the car on the journey home. These are vitamins and minerals and they can often be overlooked, however they are very important for maximising optimal performance during exercise. This plays an important role in relation to bone health, immunity and muscle function. You can get this from direct sunlight, but these foods are also great sources of vitamin D.
Iron mineral plays an important role in transporting oxygen in the blood and muscles. Calcium plays a key role alongside it’s friend Vitamin D to maintain healthy bones. Lastly, it’s very important for kids to drink enough water, pre-exercise, during and post exercise. Too often drinks can be loaded with sugar, even the fruit based ones can contain too much sugar, which is bad for teeth and can spike their blood sugar. Tip 5 – Try mixing juice like pineapple or cherry, which are also high in potassium, with half water to make it more palatable than pure water. Overall, making sure the kids’ get a balanced meal at breakfast, lunch and dinner will help ensure that they are getting all the right nutrients to fuel kids for exercise. The UK Government’s Health Committee recently released their report “Childhood obesity – bold and brave action”. It calls for urgent action on treating obesity and it’s consequences, which costs the government £5.1bn every year, and has suggested a number of recommendations. Did you know that one fifth of children are overweight or obese when they begin school, and this figure increases to one third by the time they leave primary school? The report goes onto highlight that the most deprived children are twice as likely to be obese than the least deprived, therefore childhood obesity is a significant contributor to health inequality. This is just a quick summary of some of the recommendations and for anyone that is interested in the detail you can download the report for some bedtime reading. At Eat Balanced, if we were to support one of these initiatives it would be product reformulation of high fat/salt/sugar food and drinks. 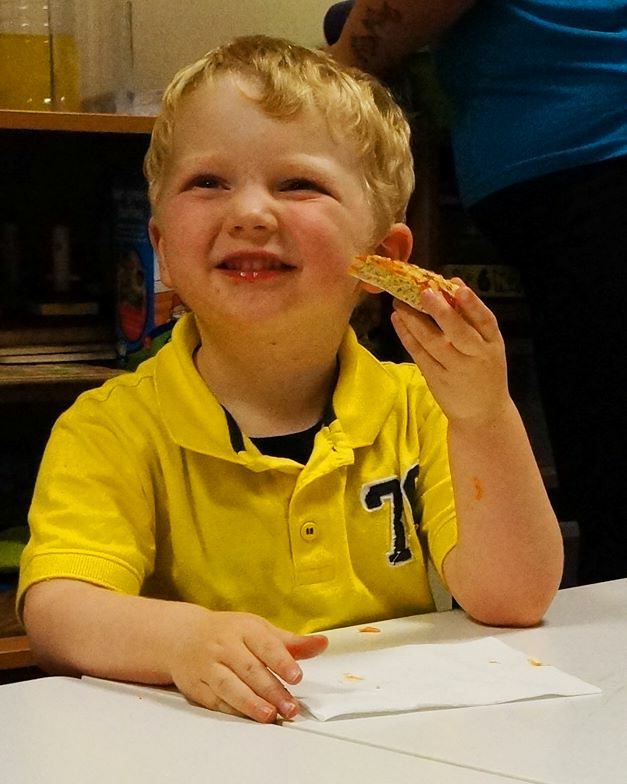 We aim to improve children’s nutrition by reinventing kid’s favourite foods, like pizza, into tasty, balanced meals. If you’re involved in the food and drink industry, we’d love to hear you’re thoughts @eatbalanced and tell us what how you would go about tacking childhood obesity. 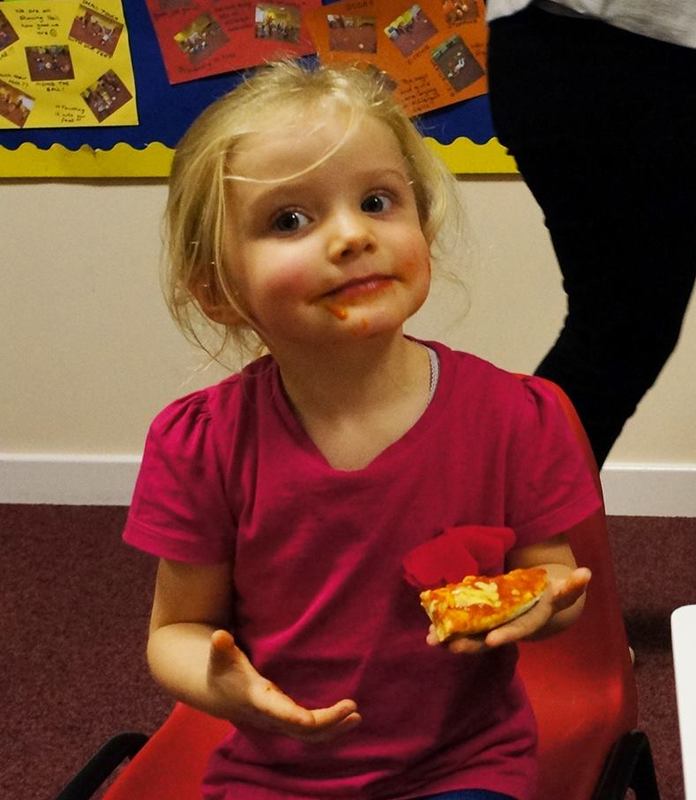 Youngsters attending Enchanted Forest Nursery in Thornliebank will be the first in the UK to ‘taste test’ the world’s first nutrionally balanced pizza for children, due to be launched to market later this year by Glasgow company, Eat Balanced. The Southside nursery has been selected following discussions between owners, husband and wife partnerships Bernie and Mariessa Devlin with award winning company Eat Balanced who launched what many are describing as the ‘world’s first healthy pizza’ back in 2012 and which is currently available in Sainsbury’s and website retail giant, Ocado.com. 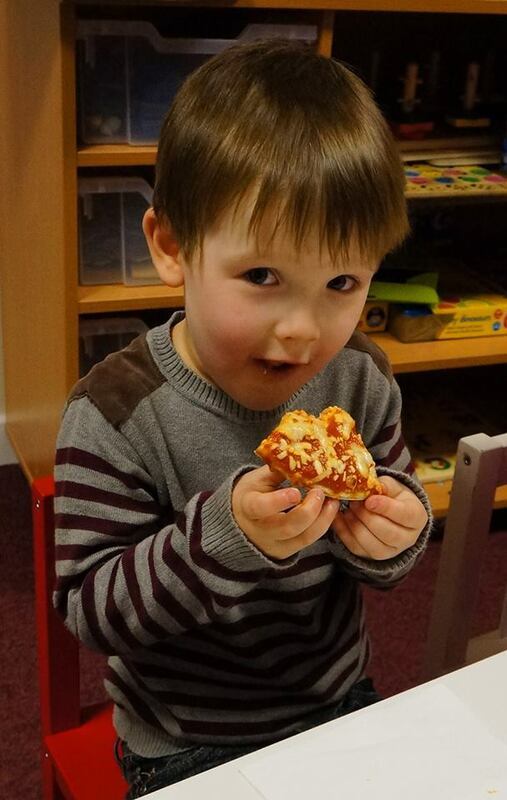 The new 7inch round and 15inch x 9inch slab healthy kids pizza, available in Cheese and Tomato, will be taste-tested by a group of 25 youngsters, aged from 3-5 years, on Friday 8 November at the award winning nursery in Spiersbridge Business Park in Thornliebank. Eat Balanced new kid’s pizzas have been designed for Food Standard Association guidelines for primary age children, including all the main nutrients, including important vitamins and minerals. It contains almost half the calories and less than 60% fat to other frozen pizza brands and is the first to include seaweed in their base. This is healthier because its sodium level is just 3.5% compared with 40% in salt used by other brands. Eat Balanced use all natural ingredients with no fortifications. 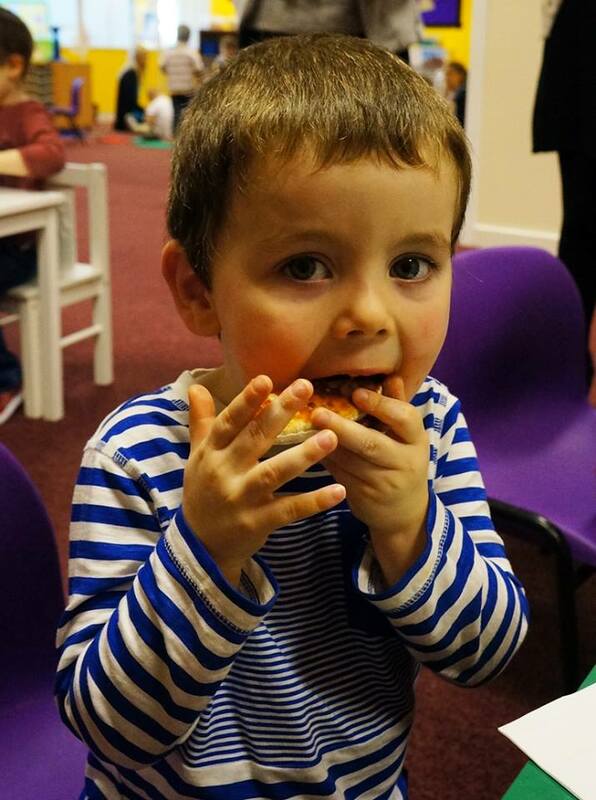 The Eat Balanced healthy kids pizzas will be sampled by children attending Enchanted Forest Nursery in Greenock later this month. A meal out with the family is a great way to get a night off from cooking and spend some quality time together. But are you happy with the children’s menu on offer? Are restaurants doing enough to consider kid’s nutrition, particularly in terms of fat, sugar and salt? We put a selection of children’s menu under the nutrition microscope. Popular restaurant chains have been under pressure to revamp their children’s menu and design kids recipes that encourage healthy eating. In the US, they have made little progress to improve the nutritional profile of children’s meals. Since meals were last analysed in 2008, a recent report found that 97% of nearly 3,500 meals failed to meet the standards set by the Centre for Science in the Public Interest for 4 to 8 year olds. In addition, a full children’s meal must contain less than 770mg of salt. So in the UK, have restaurants managed to remove the chicken nuggets and chips and replace it with chicken breast and potatoes? Or is the unlimited ice cream and fizzy drinks still high on the menu, with vegetables and milk not getting a mention? Let’s find out. We reviewed the childrens’ menu from three popular restaurant chains, to see which offered the most in terms of kid’s nutrition. The Harvester’s kids menu offered a good variety of options for fussy eaters and included calories beside each meal. Vegetables included peas, corn and beans with an unlimited salad bar. All meals would have come in with CSPI nutrition criteria with regards to calories however salt content was still too high. Although the menu contained no nutritional information, they offered a large selection of roast meats and vegetables. The challenge with this restaurant is getting the kids to opt for the vegetables as they were not served on their plate. Drinks included diluted fruit juice and water, a big tick in the box, with no fizzy drinks. This restaurant performed the worst out of the three, offering high calorie meals with few vegetables and a host of calorific desserts. The highest calorie meal was chicken nuggets with chips and beans at 706 kcals and 3,200mg of salt. The children’s banana spilt was 663 calories. Not only was the menu high in saturated fat and salt but the portion sizes were far too large. How easy is it for you to get your kids to eat a balanced meal when your out for dinner? Do you have any favourite restaurants, and why? Tweet us @eatbalanced or leave a comment.